Meade LX70 M6 Maksutov Equatorial Telescope, #270013. 6" diameter, 1800mm focal length, f/12. The Meade LX70 M6 is equipped with exceptional 6" Maksutov-Cassegrain optics offering outstanding image sharpness, contrast and resolution. 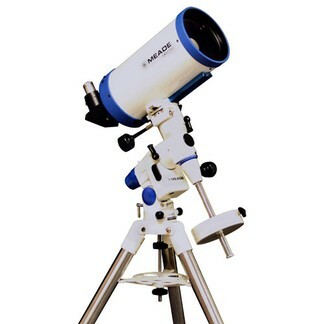 This standout choice provides detailed observation of the Moon and planets. 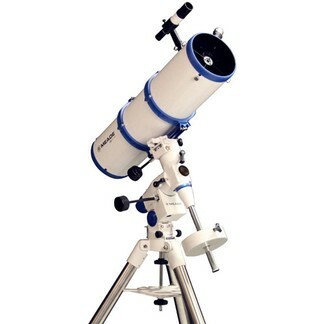 The M6, a long focal length telescope, is designed to easily soar to high magnification. Experience unsurpassed performance on planetary and lunar detail. See the rings of Saturn, Jupiter's cloud belts and Great Red Spot, and other planetary destinations. The significant light gathering ability of this 6" scope also provide the observer ample opportunity to chase down faint deep sky object such as galaxies, star clusters, and nebulae. Includes two 1.25" Plössl eyepieces 26mm and 9mm for magnifications of 69X and 200X respectively. Features a 2" diagonal mirror (with 1.25" adapter) allowing for use of any 1.25" or 2" eyepieces and precision focus mechanism. Optical tube weight is 12 pounds including dovetail mounting bracket. The Meade LX70 German EQ mount includes enhanced features including brass worm-gear drives on both axes for smooth tracking performance, aluminum setting circles and built-in leveling bubble. The large knob slow-motion control cables make it easy to track objects on those frigid nights when wearing gloves is a necessity. Push-pull adjustments in both azimuth and elevation assist in fine tuning the polar alignment, while the built-in latitude scale will help you dial in your site location quickly. The LX70 mount includes a Vixen-style dovetail for mounting optical tubes up to 20lbs for added versatility. The Meade LX70 comes complete with a solid, heavy-duty steel tripod, 8x50 optical viewfinder and an accessory tray with holders for both 1.25" and 2" eyepieces. Optionally available accessories include the Meade LX70 Dual Axis Motor Drive #670011 and the LX70 Polar Scope #ME670010. The LX70 Dual Axis Motor Drive #ME670011 motorizes both axes and awards fine slow-motion slewing control to the user through a keypad. With this addition, the LX70 German Equatorial mount becomes a versatile imaging platform. For more demanding users, the LX70 Polar Scope #ME670010 is the perfect tool to quickly and accurately achieve polar alignment. Motor drive and polar scope sold separately. Product carries one year Meade factory limited warranty. Meade LX70 R5 Equatorial Refractor Telescope, #270010. 4.7” diameter, 1000mm focal length, f/8.3. Equipped with a high quality 4.7” achromatic ¬lens set, the Meade LX70 R5 provides superior contrast and resolution for planetary viewing. The refractor scope excels in bringing details to life. The light gathering ability of the LX70 R5 presents ample opportunity to chase deep sky objects such as galaxies, star clusters, nebulae, and more. See amazing views of the Moon and planets. Explore the universe by observing the rings of Saturn, Jupiter’s cloud belts and Great Red Spot, and other planetary destinations. Optical tube weight is 11lbs, with cradle ring assembly. Includes two 1.25” Plössl eyepieces 26mm and 9mm for magnifications of 38X and 111X respectively. Features a 2” rack and pinion focuser with 2” diagonal and 1.25” adapter allowing for use of any 2” eyepiece for a panoramic experience. The Meade LX70 German Equatorial mount offers optimal performance features including brass worm-gear drives on both axes for smooth tracking performance, aluminum setting circles and a built-in leveling bubble. The large knob slow-motion control cables allow for easy tracking on those frigid nights when wearing gloves is a necessity. Push-pull adjustments in both azimuth and elevation assist in polar alignment while built-in latitude scales help dial in site locations quickly. The LX70 mount includes a Vixen-style dovetail for mounting optical tubes up to 20lbs for added versatility. Mount weight is 9 pounds, with a single 11.5 pound counterweight. The Meade LX70 R5 refractor comes complete with a heavy-duty steel tripod, 6x30 optical viewfinder, and an accessory tray with holders for both 1.25” and 2” eyepieces. Meade LX70 R6 Equatorial Reflecting Telescope, #270011. 6" diameter, 750mm focal length, f/5. The Meade LX70 R6 is equipped with a high-quality parabolic primary mirror, aluminized and over-coated for great performance. This fast f/5 optical system provides the observer spectacular wide-field views and presents ample opportunity to chase deep sky objects such as galaxies, star clusters, and nebulae. See amazing views of the Moon and planets. Explore the universe by observing the rings of Saturn, Jupiter's cloud belts and Great Red Spot, and other planetary destinations. Includes two 1.25" Plössl eyepieces 26mm and 9mm for magnifications of 29X and 83X respectively. 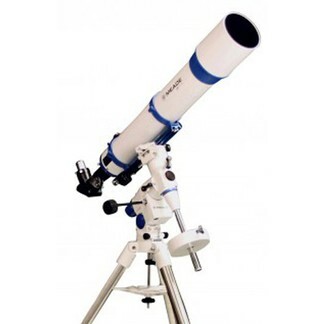 Features a 2" rack and pinion focuser with 1.25" adapter allowing for use of any 2" eyepieces to maximize this telescope's panoramic deep field potential. Optical tube weight is 12lbs including cradle rings. The Meade LX70 German EQ mount includes enhanced features including brass worm-gear drives on both axes for smooth tracking performance, aluminum setting circles and built-in leveling bubble. The large knob slow-motion control cables make it easy to track objects on those frigid nights when wearing gloves is a necessity. Push-pull adjustments in both azimuth and elevation assist in fine tuning the polar alignment, while the built-in latitude scale will help you dial in your site location quickly. The LX70 mount includes a Vixen-style dovetail for mounting optical tubes up to 20lbs for added versatility. Mount weight is 9lbs, with a single 11.5 pound counterweight. The Meade LX70 comes complete with a, heavy-duty steel tripod, 6x30 optical viewfinder, an extension tube used for astrophotography, and an accessory tray with holders for both 1.25" and 2" eyepieces. Meade LX70 R8 Equatorial Reflecting Telescope, #270012. 8" diameter, 1000mm focal length, f/5. As the largest diameter model of the LX70 series, the R8 offers a 75% increase in light gathering ability and image brightness over a 6" telescope. The Meade LX70 R8 is equipped with a high-quality parabolic primary mirror, aluminized and over-coated for great performance. This fast f/5 optical system excels provides the observer spectacular wide-field views and presents ample opportunity to chase deep sky objects such as galaxies, star clusters, and nebulae. See amazing views of the Moon and planets. Explore the universe by observing the rings of Saturn, Jupiter's cloud belts and Great Red Spot, and other planetary destinations. Features two 1.25" Plössl eyepieces 26mm and 9mm for magnifications of 38X and 111X respectively. 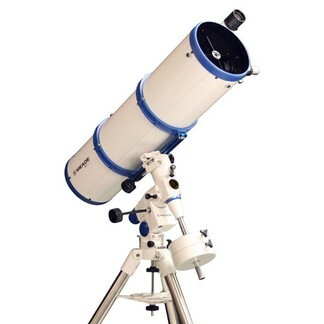 Includes a 2" rack and pinion focuser with 1.25" adapter allowing for use of any 2" eyepieces to maximize this telescope's panoramic deep field potential. Optical tube weight is 20lbs including cradle rings. The Meade LX70 German EQ mount includes enhanced features including brass worm-gear drives on both axes for smooth tracking performance, aluminum setting circles and built-in leveling bubble. The large knob slow-motion control cables make it easy to track objects on those frigid nights when wearing gloves is a necessity. Push-pull adjustments in both azimuth and elevation assist in fine tuning the polar alignment, while the built-in latitude scale will help you dial in your site location quickly. The LX70 mount includes a Vixen-style dovetail for mounting optical tubes up to 20 lbs. for added versatility. Mount weight is 9lbs, with two 11.5lbs counterweights. The Meade LX70 comes complete with a solid, heavy-duty steel tripod, 8x50 optical viewfinder, an extension tube used for astrophotography, and an accessory tray with holders for both 1.25" and 2" eyepieces.